Cartology | Petrophysical Solutions, Inc.
Cartology is the study and interpretation of maps, charts and mapping processes for scientific, artistic, historical and theoretical purposes. For PSI, antique maps represent an amazing paradigm for today’s E&P activities. From time to time, we’ll write about what the maps represent: The ongoing need for consistent, comprehensive interpretations that represent all the information gathered from the physical world. Enjoy reading – Bill Price, President. Here be risks, which are mitigated by experience and expertise. The style of geophysical presentation has changed dramatically but there are still hazards that you as E&P professionals face everyday. Those are the risks of just not knowing what recoverable reserves, if any, are down there beneath the surface of the earth, or beneath its waters. Since it’s still crucial for companies to increase their chances for success in the search for hydrocarbons, you want to maximize those opportunities. Tapping a group of petrophysicists like us can pay off in much lower risk of failure. PSI has spent 15 years putting our brand of petrophysics to work for companies worldwide; our expertise with rock and fluid evaluation has been proven over and over again. Like a great mapmaker, we can reveal more of what exists in the real world to make your petrophysicists more effective; or even serve as the petrophysics resources you need to lower the risks of exploration, , even when you’re facing a monster project. It’s the proven know-how that overcomes the unknowns. And in 2011, you’ll see new advertising from PSI that focuses attention on expertise you can use. One ad even features this chart from the Mapmaker of Antwerp himself. 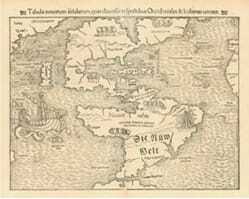 “Tabula Novarum Insularum,” the 1540 map created by cartographer Sebastian Münster, is one of the most influential maps of the Americas ever created. It was repeatedly printed in some forty editions over the next 100 years and that planted some of the imagery – and some of the myth – deep in the consciousness of generations of explorers. 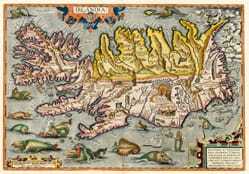 But there is a mistake on the map, a myth that Münster mistakenly perpetuated. He took his data from Giovanni de Verrazano who sailed by the Outer Banks of Carolina in 1524. Verrazano spotted the sounds, the open water, on the other side of those barrier islands and mistook this reach for the fabled Northwest Passage. European rulers and merchants ached for an alternative, shorter route to Asia (“the wealth of the Indies”); they would jump at any solution that seemed to lead in that westerly direction. Had Verrazano taken the time to investigate, he would have caught his mistake. Instead, because it was on the map, it influenced the thinking of everyone in the Western world for decades or more. This is much like we see in the oil industry today…many companies are sold on quickie interpretations. With so much data, companies can get misled by the fast look that may be pretty. Then they waste their valuable time and treasure (think manpower costs, rig rates, and so on) on completing zones that shouldn’t be tested, for example; or worse, missing productive zones that should have been identified. Because of the errors, the Münster map didn’t lead to quick riches (but over a century or more, its value was immense.) Consider today’s more urgent opportunities for discovery: It’s important for companies to spend just a little time working their way to answers that are derived from good, proven science. That is when you can strike it rich.